Long lines of students sitting on the grass or the pavement, endlessly playing cards, snacking, talking and dozing? If it sounds like madness, it is — Midnight Madness. 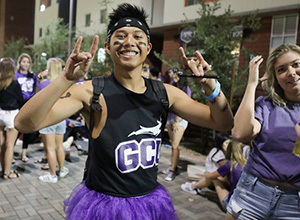 Grand Canyon University students seeking premium seats for Midnight Madness are tailgating and tenting, as organized by the leaders of the Havocs, GCU’s nationally recognized cheer section. Camp Elliott, coined for Daniel Elliott, the first student to start the tradition, in 2015, will end on Friday, Oct. 5, at 10 a.m. when all students will be given their lineup numbers. The doors to GCU Arena will open at 11:15 p.m. for Midnight Madness, featuring the men’s and women’s basketball teams, along with their coaches, Dan Majerle and Nicole Powell, and performances by the spirit teams: the Thundering Heard Pep Band, Cheer, Dance and Thunder. The theme for this latest edition of Midnight Madness is mysterious. “They are in for a wild night since The Joker, “Thunder,’’ has taken over Gotham City University Arena, or as we all know it, Grand Canyon University Arena,’’ said Taylor Griffin, director of In-Game entertainment.